Microsoft Excel is a powerful tool for data analysis and reporting. The Process IT Development Excel OPC Server is a combined OPC Server and OPC Client, designed to serve data from Excel spreadsheets. The OPC Server supports reading and writing of Excel data. There is a one-to-one mapping between an OPC item and an Excel Sheet/Cell. The OPC server can be configured to run macros defined in the Excel spreadsheet on a regular basis. The calculations performed in a spreadsheet will often use live process data from the plant. The built-in OPC client allows for very efficient updating of cells in the spreadsheet from OPC data residing in DCS or SCADA system. 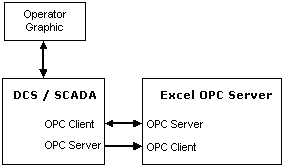 There is no need to write from the DCS/SCADA system to the Excel OPC server. Updates via the Excel OPC Server's Built-In OPC Client occur on data change, which is a very efficient mechanism. Another possible configuration for the Excel OPC Server is shown below. Here the Excel OPC Server acquires data from another (third-party) OPC Server, not connected to the main DCS/SCADA system. As with the previous configuration, the advantages of this approach are that there is no need to write data to the Excel OPC Server, and in addition, any data changes from the third-party OPC Server to the Excel OPC Server are performed by exception. Note that we do not recommend the use of Excel for process control purposes. It is for this reason that the OPC client component of the OPC server is designed to be read-only. The Macro Execution facility allows the user to define a number of macros for periodic execution. The macro name and the execution period (in seconds) is then defined in a separate section of the INI file, such as [Macro 1]. Note that the OPC Server does not limit the number of macros that the user can define. There will, of course, be a practical limit dependent on the complexity of the macros, and this limit can really only be determined through testing. If the application has been licensed, this entry will be a license key string. If the license key is missing or incorrect (or "DEMO" as in the sample) then the OPC server will shut down after 1 hour. This is the name of the person or company to which the OPC server has been licensed. This directive instructs the OPC Server whether it should use start up a new instance of Excel, or whether, if Excel is already running, it should use the existing instance. If the OPC client is on the same PC as the Excel OPC Server, then use of the NewExcelInstance directive is straightforward. If, however, the OPC client is on another PC (and therefore the Excel OPC Server is being instantiated using DCOM), then this directive needs to be considered in light of the DCOM settings. For example, you have your OPC client on machine B, and want to connect to an Excel spreadsheet on machine A, which is currently open by the user logged into machine A. The Excel OPC Server would therefore be installed on machine A, and in DCOM, under Identity, it would be set to run as the Interactive User. This is the name of the Excel Workbook that is to be used. Note that the Excel OPC Server supports one Workbook, although this may consist of several sheets. This is the name of the macro, and is the same as the name of the subroutine in the VBA code module. Note that the subroutine needs to be Public, which is the default. This is the period, in seconds, at which the Excel OPC Server will run the macro. In the example here, subroutine IncrementCellM1() will get called every second (Period = 1). This subroutine increments the value of Sheet1, Cell M1. Const strCell As String = "M1"
In this section it is possible to customize your installation. To avoid unnecessary calculations in Excel, it can be useful to disable autocalculation when writing data. If specified, this parameter is the length of time in milliseconds that AutoCalc is disabled when performing a write. The default is that AutoCalc is not disabled during a write. Note that it is also possible to manipulate the Excel AutoCalc setting directly using the Excel.CalculationMode OPC tag. The name for the OPC item. The OPC server defaults to the period (.) as the separator when browsing the server namespace. Specifies the data type that the OPC item will have. If the data in the Excel cell is of a different type, the data is converted to the type that is specified here. The row-column reference for the cell. For non-English versions of Excel it is necessary to change the cell row and column references to the local language. For example, the cell R1C4 would be given by Z1S4 when using a German version of Excel. Use any character in this column to indicate that it is permitted to write to the cell via OPC. Please remember to include the name of the registered user of the OPC server, along with the name of the machine that the software will be running on. Alternatively, send an email with these details to the tech support email address below. Please get in touch by telephone or email in the event of any problems with the installation or operation of the OPC Server.